Anti-Semitism and hatred of Free-Masonry was prevalent between the two Wars and even prior before the First War. The anti Dreyfusism and Maurassian movements in France had significant influence on Conservative and extreme Right-wing thinking in Belgium. At the time, Eugenist and racist theories were expressed freely in the supposedly rigorous andobjective scientific community. These theories were initially expressed in an insidious fashion, but soon appeared openly in all their brutality. As such, an anti-semitic and anti-Masonry climate arose well before the German occupation. In France, the infamous trio of doctors Louis-Ferdinand Destouches (Céline), Nobel-prize winner for Medicine Professor Alexis Carrel, and Eugenist George Montandon played a primordial role by holding a conference in Brussels on May 3, 1938 on their racist theories. This is best illustrated by the eviction of Professor Handovsky – of Jewish origin - from the University with the help of Professors Daels and Heymans, Nobel Prize winner for Medicine. Dr. Ouwerx from Tienen became the leader and undisputed instigator of the extreme right wing movement and focused his efforts on the supposed Jewish-Masonry conspiracy. Ouwerx never did become chairman of the Wartime Order of Medicine, but instead it was the avowed anti-semite, Dr. Frans Van Hoof, whom the Germans preferred, who was apointed. Anticommunism and anti-socialism were also associated with Ouwerx, in addition to a negative attitude concerning psychoanalysis which was considered of Jewish origin and supposedly a science responsible for the destruction of the family. We will need to review these very important elements to understand the Imianitoff Affair. Dr. Ouwerx led the Belgian anti-Masonry League (L’Epuration - de Bezem) and in 1939 he published a brochure, ‘Les cagoulards démasqués’, in which he listed names of supposed Masons, which later was used as the basis for a further denunciation under Nazi occupation. In 1940, he published a new incriminatory brochure ‘Les Précurseurs du Communisme. La Franc-Maçonnerie peinte par elle-même’. In 1939 he published a pamphlet ‘Trois impostures Le Scandale Imianitoff, la Franc-Maçonnerie et la bolchévisation de la Médecine’. Furthermore, the anti-Masonry publications of ‘Burcht-Le Rempart’ were inspired by the Germans. Dr. Soenen, professor of Rassenkunde at the University of Ghent and reknown anti-Semite, published his racist books with the same editor. Anti-Masonry events were organised throughout the country. The Imianitoff Affair contained all the hatred and contradictions of the 1930s. Fréderic Imianitoff, freemason, socialist and of Jewish origin held an English university degree in medicine. He was one of the founders of the discipline of preventive medicine in Belgium, and Secretary General of the Belgian Society of Preventive Medicine and Eugenics. Together with René Sand, General Secretary for the Public Health and professor at the Université Libre de Bruxelles, Imianitoff was one of the founders of social medicine. Sand was also associated with the socialist party, while Imianitoff and Sand became targets for the fascists and Conservatives. The so-called Imianitoff Affair began in the Parliament in 1937, where he was attacked by Rexist politicians, including Paul de Mont of Rex Vlaanderen, and Edmond van Dieren from the VNV. The Ministry of Justice took the affair in hand in 1938 and tried in court in 1939. Imianitoff was sentenced to 6 years’ imprisonment for forgery concerning his false military distinctions, and for performing an abortion, yet he was not sentenced for unlawful practice of medicine, since his medical degree had been judged to be equivalent to a royal decree in 1926. The Imianitoff affair reflects all the hatred, contradictions and antagonisms of the period, including hatred of psychoanalysis and deemed a destroyer of the family values. Professor Jacques de Busscher, professor of psychiatry at the University of Brussels, Mason and member of the Septentrion lodge in Ghent, was also denounced in Ouwerx's publications. The ideas behind preventive medicine, as proposed by Imianitoff and Sand, and more generally the organisation of medicine which they promoted was considered Bolshevik and collectivist. As well, ideas promoted by Nazi Germany and Vichy-France and incarnated by professor Alexis Carrel, also proposed hygienist and preventive medicine. Their pursuit for hygienist purity led them eventually to their extermination. The aim of preventive medicine was therefore entirely different according to the regime in power. Exactly the same thing can be said of eugenism. Imianitoff also made a distinction between positive and negative eugenism. Positive eugenism was seen as preventive medicine, while negative eugenism which included sterilisation and euthanasia led to Nazi eugenism and the T4 programme. 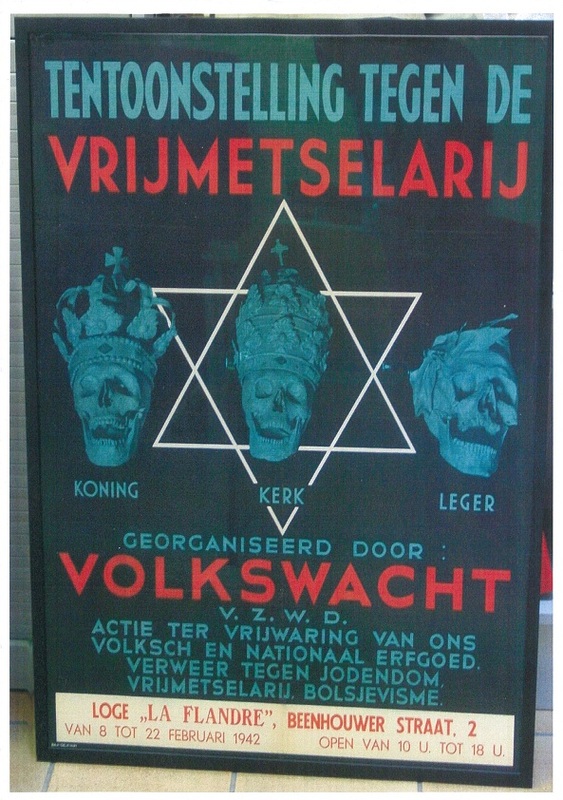 Specifically, the Protocols of the Elders of Zion was mentioned in detail in Ouwerx’s works. He was apparently well versed on the subject, as he mentioned certain elements of the Bern trial of November 1, 1937. This trial was inititated by the Jewish community against the Nazis with the intent of proving the falsification of the protocols. The idea of the conspiracy constituted the basis for the incrimination and the eventuals denunciations. The list of Freemasons published by Ouwerx in his publications, in the Libre Belgique and in Le Pays Reel (by Rex), was later be used by the Nazis. The Germans and as well as the Collaborators considered the University of Brussels to be a bastion of Freemasonry and Jewery. The German order of October the 28th 1940, prohibiting Jews access to certain offices hastened the suspension of Jewish professors at the University of Brussels and their practice in the capital’s public hospitals. In 1933, the book “The Third Reich and the Jews” appeared. It gave full voice to the protest that was breaking out in various European countries and from a variety of quarters, against the Nazis’ attitude towards German Jews. In 1934, students at the University of Brussels as well as their professors established committees which were referred to as: comités de vigilance anti-fasciste. In 1939, 154 professors, 90 of whom were connected with the Université Libre de Bruxelles (ULB), signed a manifesto. Of the four universities of Belgium (Brussels, Ghent, Louvain and Liège), we have concentrated our studies on those of Ghent and Brussels for the purposes of this presentation. There was certainly reason to turn the University of Ghent into a political centre of collaboration. After all, it is there that the Von Bissing story played out. The University had already been changed previously into a Flemish-oriented institution during World War I. Kriegsverwaltungsrat Franz Petri wanted to appoint German visiting professors as quickly as possible. In the Faculty of Medicine of the University of Ghent, Daels and Speleers were the most vocal opponents to the return of the ‘Toulouse’ professors. After May 1940, about 70 professors from Ghent stayed for some time in the south of France. On June 23rd 1941, Reichsgesundheitsführer Leonardo Conti was welcomed with open arms to the Faculty. Since its very beginning in 1834, the University of Brussels had always been an outspoken liberalsocialist institution. In November 1940, it was allowed to reopen with one important proviso: 75 radical professors must be replaced by ‘reliable’ Flemish colleagues. Heymans, the Nobel Prize winner, and Daels, both from Ghent, were specifically mentioned as being ‘reliable’. The Flemish activists wanted to go even further by demanding that Flemish students be able to begin their studies at the ULB. The anti-Jewish measures had their impact on the medical faculty, from which Oscar Weill, Neumann, Cohen, Schwetz and others had been dismissed. In the end, the appointment of four pro-German professors led to the closure of the ULB on November 25th 1941 (officially on August 13th, 1942). The newly appointed professors included no less a figure than Antoon Jacob, who in 1919 had been condemned to death for collaboration. Three hundred lecturers and 3,600 students (out of a total of 12,000 students in Belgium) had to go elsewhere. Six hundred of the ULB students registered at the University of Louvain, but for the Jewish students, their studies came to an abrupt end. They could only continue their studies clandestinely or under a false name. From December 2, 1940 onward, every registered student was required to sign a declaration supporting Decree Number 2 of October 28 and vouch that the restrictions did not apply to them. The Decree stipulated that they were not Jewish nor had Jewish ancestors on either their father’s or mother’s side. When one considers the situation of the doctors in the Belgian resistance, one can divide them into 3 broad categories. The majority were involved in espionage. Most doctors maintained close contact with the Resistance and performed clandestine surgical operations. Finally, they were those who were involved in the clandestine press. Because of the nature of their espionage activities, a number of these doctors were eventually deported to Germany for sentencing, and in some cases, after a year of captivity, were beheaded. Some Belgium doctors were shot or did not survive the concentration camps. Or, doctors who were victims of the anti-Jewish measures were murdered in Auschwitz. Anti-Semitism and hostility to Freemasonry already existed long before the Second World War. The ULB was regarded as a bastion of Jews and Freemasons. It is in this context that one must view the persecutions which were to take place. While the medical faculty of the ULB suffered a loss by the dismissal of all Jewish professors, the medical faculty at the University of Ghent had definitely never been a model of Resistance; quite the opposite in fact. Even if a number of Ghent doctors were actively involved in the Resistance, there remains today a strong desire to consider Speleers, Heymans or Daels as icons of the Faculty of Medicine. Some symptoms are apparent in the history of 20th-century medicine. Hitler saw himself as the political Robert Koch, who was the recipient of the Nobel Prize in 1905 for his discoverery of Mycobacterium tuberculosis. Hitler regarded Jewry as a Mycobacterium of social decay (1941). The enemy was no longer an opponent as in a classical conflict, but degraded to the level of an animal. It is striking how 1913 Nobel Prize winner Charles Richet’s La sélection Humaine, concerning the elimination of ‘unsuitable’ people, is recognized as scandalous, whereas Nobel Prize winner Alexis Carrel’s L’homme cet inconnu (1935) remained a more or less successful title until the 1950’s.